It has been a while since I published the last post in this series. Back then the topic was holiday lights that had brighten my life in all senses, including literally. Today’s post is kind of the opposite. As we suspected it would be, this morning we woke up to an overcast morning not looking promising for the impending solar eclipse. As I looked at the sky before driving to work, I couldn’t see anything but grey clouds. I thought about how it should be disappointing to all those who had planned on watching the eclipse, started my car and called a friend to discuss the mischance. I: What are you doing? F: It comes and goes. At this point I noticed that clouds parted a little, and there it was – a small sliver of sun. It’s hard to call sun a “small thing,” a solar eclipse is hardly something that is associated with illuminating things, and I’m sure that there are thousands of better pictures taken of this event. But for the rest of the day I kept proudly showing my “impossible picture” to friends and colleagues. And it did make my day brighter. This entry was posted in Random Stuff and tagged solar eclipse. Bookmark the permalink. I’m so envious that you guys in the US were able to see such a magnificent solar eclipse with your own eyes. Thanks for sharing that photo….it is amazing!!! It was mainly overcast here as well. I tried to see a bit when I went out for my lunch break, but it wasn’t meant to be. Thanks for sharing your “impossible” picture! Actually, your photo is very lovely, with the faint blue behind the dark grey and white clouds! You have every right to be proud of it! Thank you for sharing it. Of the photos I took (not directly at the sun), I think my favorites are of the crescent-shaped shadows of the eclipse on the pavement. Wasn’t it amazing to be able to see such an event? I was! When I arrived to the office, it was just after the highest degree for our area, and there was a couple of dozens of people outside watching the event. It felt nice to be a part of that happening. Nice job of capturing the photo! 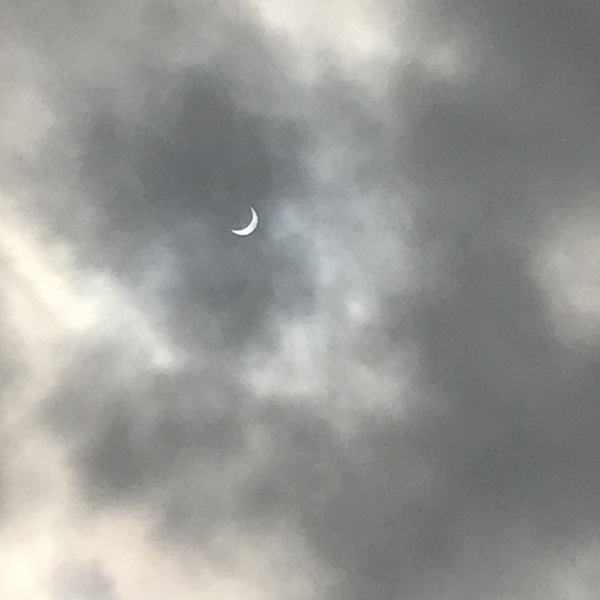 I was able to see a crescent from inside my office building. Someone had solar eclipse glasses which got passed around. I’ve heard there are scary statistics on how many people hurt their eyes every time a solar eclipse is observable from populated areas.